Easy to maintain in our Grow Tub Containers. 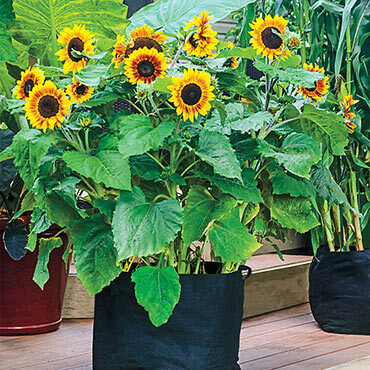 This eye-catching new choice for container sunflowers features striking bi-colored petals around a dark, pollen-free core. An early-maturing branching type, Solar Flash grows between 16" and 20" tall. Easy to grow and maintain, expect a variety of honeybees and butterflies to enjoy this beauty, too! Height: 16 - 20 inches. Seed Count: About 15 seeds per packet.